Q: How do I anchor something heavy to drywall? I’d like to install a hanging ceiling lamp bracket, but don’t think a regular hook will hold. What can I do? A: You’re wise to be concerned because a regular drywall anchor in drywall won’t reliably hold a ceiling lamp. That said, an ordinary hook will hold just fine if it’s driven into wood framing under the drywall. You’ll need to use a stud finder to identify the location of wood framing, then you’d have to be sure you hit it with the hook. Drill through the drywall but not beyond, then twist the hook in by hand. It should get tight and grip firmly. If the preferred location of your lamp lands where there is no wood framing, use a hollow wall anchor instead. These have metal arms that open up once the unit is pushed in place and tightened. Hollow wall anchors hold a lot of weight safely because the arms grip the back face of the drywall. Hollow wall anchors are what you see to the right. For lighter objects than a lamp, especially those to be installed on a wall not a ceiling, consider threaded drywall anchors. 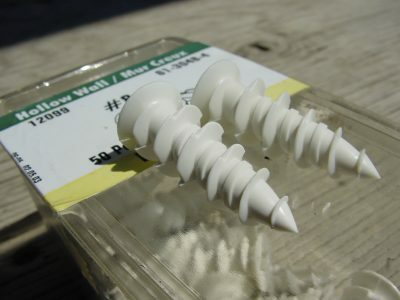 These are usually white plastic and have coarse threads that grip securely into predrilled holes in drywall. Some brands claim you can drive them directly into the drywall without predrilling, but this is wishful marketing in my experience. 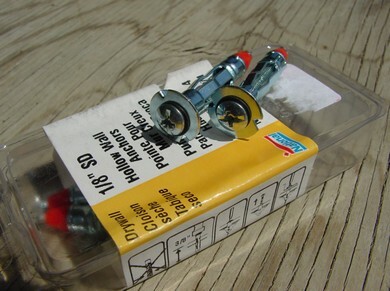 Drill a hole ahead of time in the drywall using a bit that’s the same size as the part of the anchor below the threads. Tighten the anchor into the hole, then drive a screw in afterwards. Just be careful. If you try to take out the screw again, it will come out with the anchor about half the time. And once the anchor has come out, it can’t grip into the hole again. You can see a threaded drywall anchor to the left.